Ed Pittman (Martin Automatic) with Angel Gomez (Production Manager) and Victor Abellaner (General Manager/Adhesivos del Segura). Located in Murcia, in Spain's south east corner, Adhesivos del Segura SA is one of the country's best equipped label converters, with more than 16 printing machines, and 12 cutting and finishing units, including digital technology. Renowned for supplying labels to the food industry as well as high volumes of blank labels for shipping purposes, the company currently employs more than 150 people at its 7,000sq/m plant that generates more than 27 million square metres of label stock each year. With such a high level of demand to meet, the company operates a triple shift five days per week and investigated ways of increasing productivity and press throughput. 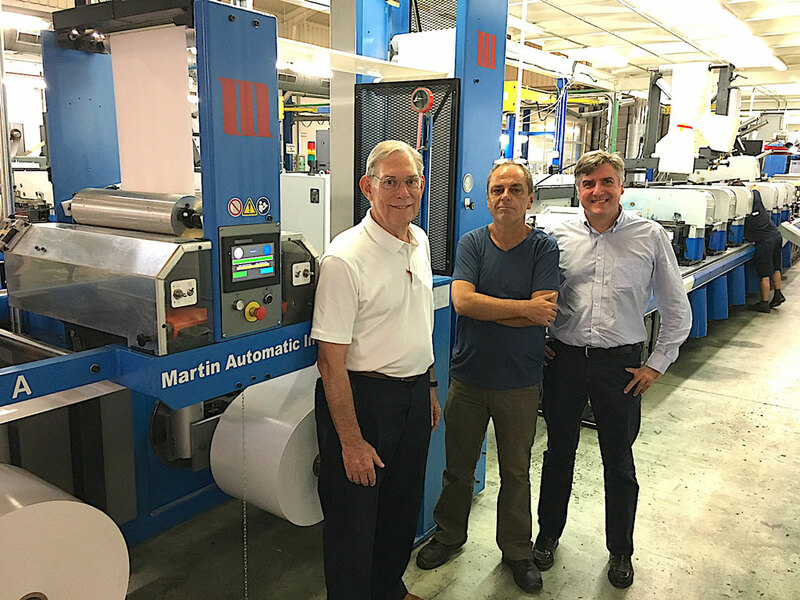 After detailed market research, the company decided to invest in Martin Automatic roll handling technology, and in 2015 installed the first of four of the American manufacturer's MBS unwind/splicer machines, which have since been joined by another MBS and LRD transfer rewinder. Speaking for Martin Automatic, Sales Manager for Southern Europe, Ed Pittman commented: "We were convinced that automation would make a big difference to productivity at Adhesivos del Segura, and so it proved - but to secure five more orders in the space of three years is a clear indication of the benefits the customer sees in Martin equipment." According to Victor Abellaner, General Manager at the Murcia plant, Martin technology was the preferred choice for its relative simplicity, which implied a high degree of reliability that has been well proven in the rigours of day-to-day commercial operation. "We like the fact that the splicers are not over-reliant on servos and electronics - it makes them easier and cheaper to maintain by our in-house technicians - but in reality, they have been a model of reliability." The first four MBS splicers are all fitted to Gallus EM series presses: three on EM 340s and one on an EM 410. The latest MBS and first LRD are fitted to the company's EMS 430. Overall, Victor Abellaner estimates they are gaining 25 minutes per shift with the Martins, working on five minutes per roll change, and significantly reducing waste by 300 metres per shift. Grossing these numbers up, the Martins are adding 375 minutes of production time per working day across the five presses. This equates to 31 hours per week, or 1600 per year, and an annual saving of some 230,000 metres of substrate. With run lengths reducing from typically 8,000 metres a few years back to more like 1,500 metres today, the case for automation to facilitate roll changing has grown. Label production at Adhesivos del Segura is still predominantly paper based but with demand for film and foil products rising quickly. This mix of substrates makes the case for automation even stronger, so Victor Abellaner's comment that the Martins are: "buy, install, set and forget," provides ample justification for the investment. "If you add the fact that we have had minimal requirement for service or parts since installation and that all our operators find the Martins very intuitive to use, then the case is well and truly made," he added.